Start with the pretzels. The dough takes a good hour or two to rise, so plan accordingly. Mix the water, yeast, sugar and salt and let it set for about 10 minutes. This will help activate the yeast. 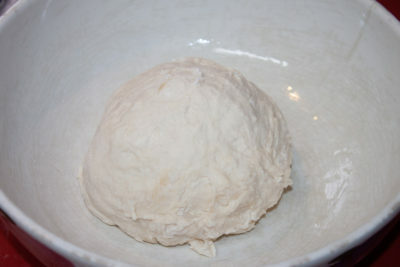 Stir in the flour and mix until you have a soft dough. Turn it out on a board and knead it four or five times. Clean the bowl and rub with some oil. Put the dough back in and cover it with a loose towel. Put it in a warm place and let it rise until at least double its size. 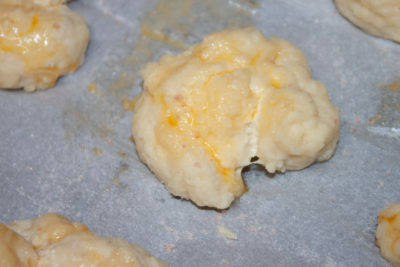 Punch the dough down and divide it into 12 even balls. Pull the pieces to make a rope then wrap like a traditional pretzel or make a little knot, like I did. Heat a large pan of water and add the baking soda. Make sure the water is less than half way up in the pan. The baking soda will bubble and foam, a lot!! 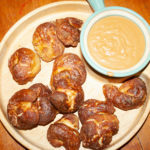 Carefully lay the pretzels in the boiling water and cook for about 30 seconds on each side. Drain on paper towels, then carefully set them on a baking sheet that is covered with parchment paper. 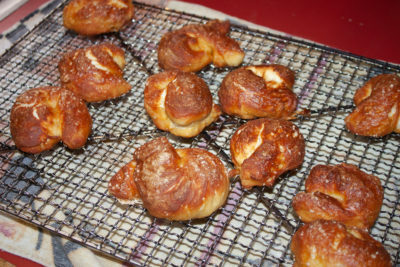 Beat the egg with a teaspoon of cold water and brush the wash on all of the pretzels. Add salt (we like a lot). I used fresh ground sea salt. Bake at 450° for about 10 to 15 minutes, until golden brown. While they are baking, make the cheese dip. Melt 2 Tablespoons of butter in a medium pan. Stir in 1/2 Tablespoon of flour and cook until the flour starts to brown. Slowly pour in the beer and simmer just until it starts to thicken. Melt the cream cheese in the mixture, stirring and pushing on it constantly. Add all the remaining ingredients except the cheeses. When all the cream cheese has been incorporated, add the remaining cheeses and simmer until they are melted all the way. The dip will have a golden brown color because of the beer. Serve everything warm or cold – Either way it’s a treat! 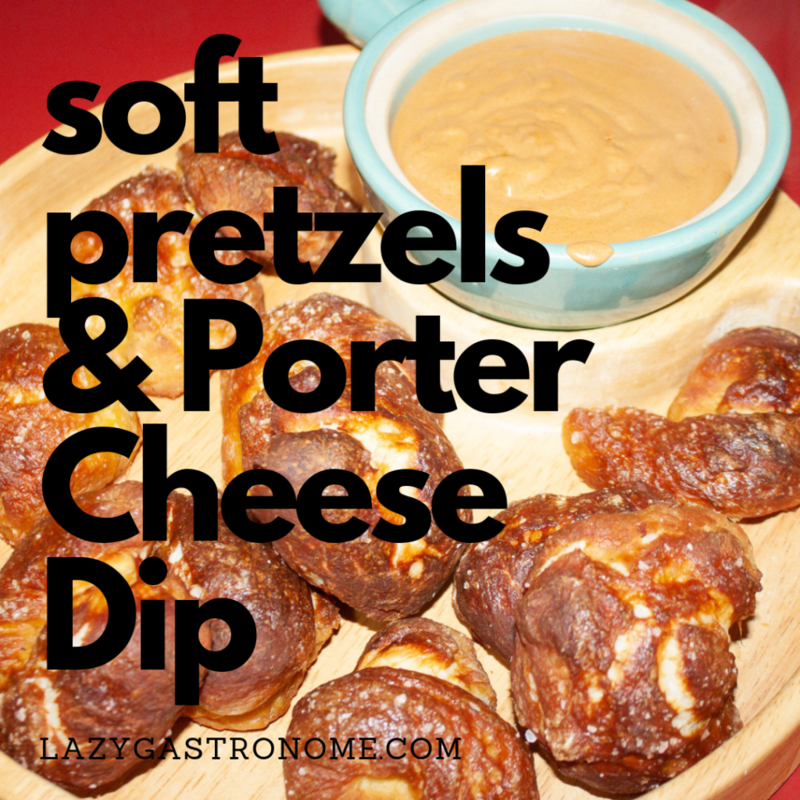 Ah, pretzels and beer – that quintessential pair that makes snacking so fun! Well, how about the beer in the dip? The alcohol cooks out leaving the rich flavor of the dark beer to mingle with the sharpness of the cheese. Start with the pretzels. The dough takes a good hour or two to rise, so plan accordingly. 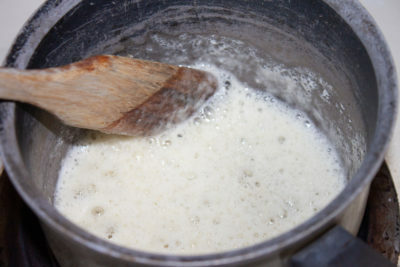 Mix the water, yeast, sugar and salt and let it set for about 10 minutes. This will help activate the yeast. 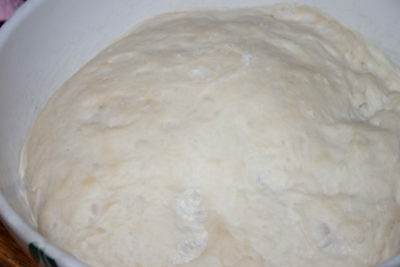 Stir in the flour and mix until you have a soft dough. Turn it out on a board and knead it four or five times. Clean the bowl and rub with some oil. Put the dough back in and cover it with a loose towel. Put it in a warm place and let it rise until at least double it’s size. 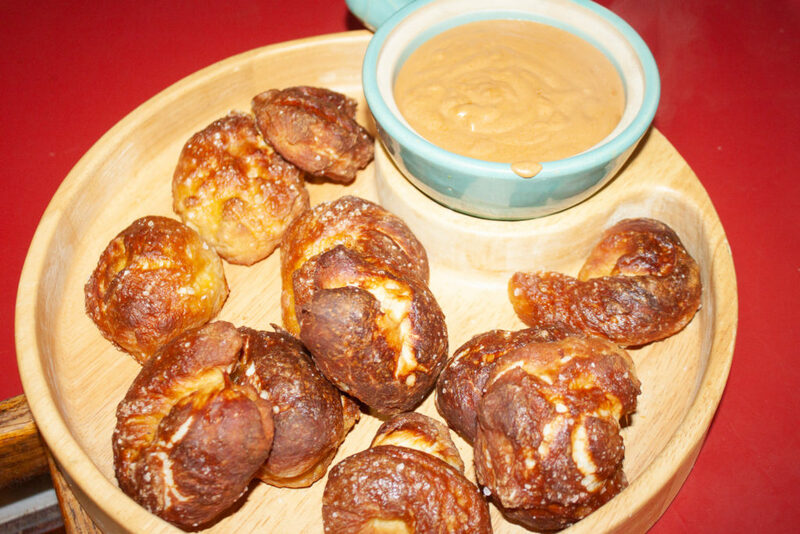 Carefully lay the pretzels in the boiling water and cook for about 30 seconds on each side. Drain on paper towels, then carefully set them on a baking sheet that is covered with parchment paper. 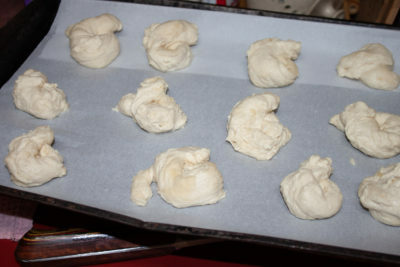 Bake at 450° for about 10 to 15 minutes. While the pretzels are baking, make the cheese dip. Melt 2 Tablespoons of butter in a medium pan. Stir in 1/2 Tablespoon of flour and cook until the flour starts to brown. Slowly pour in the beer and simmer just until it starts to thicken. 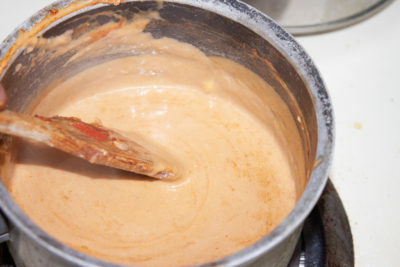 Melt the cream cheese in the mixture, stirring and pushing on it constantly. When all the cream cheese has been incorporated, add the remaining cheeses and simmer until they are melted all the way. 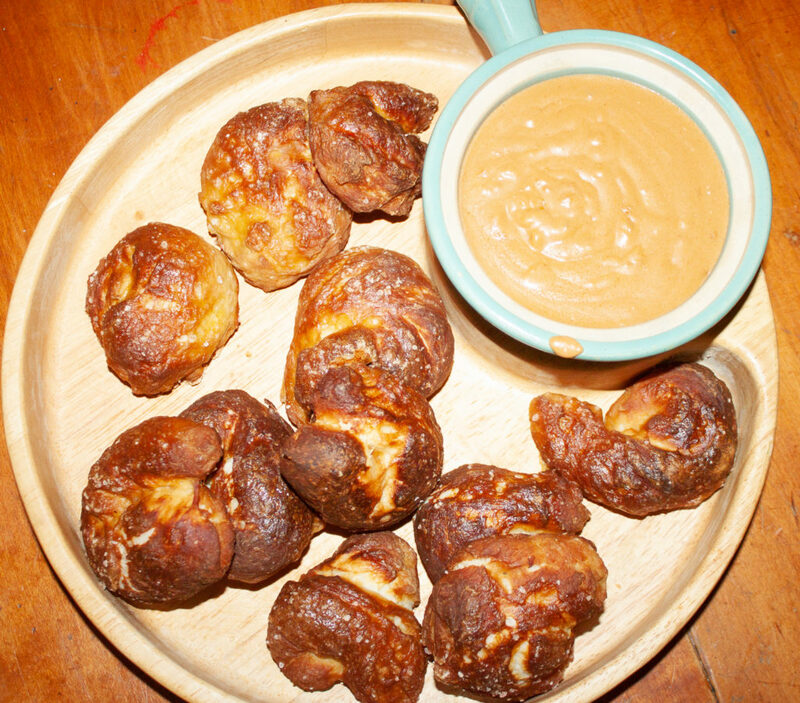 The dip will have a golden brown color because of the beer.Serve everything warm or cold – Either way it’s a treat!